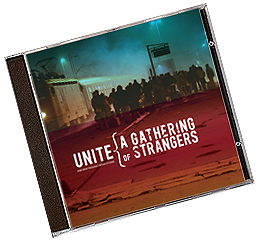 Released in 2010, ‘A Gathering of Strangers’ was a one-off Transglobal Underground project creating a virtual network of artists across Europe working separately and together on traditional songs of separation and togetherness. Not folk, not electronica, not folktronica, ‘A Gathering of Strangers’ didn’t so much straddle genres as bypass them altogether in true TGU style. The result is an unrepeatable work that’s gained cult status over the last few years. As Europe moves nervously into an uncertain future, ‘A Gathering of Strangers’ is a musical look into an uncertain past, putting toether a collection of traditional songs of emigration, exile and longing through a series of radical machines and electronic beats, emerging with new sounds and visions of an uncertain future. This is a collection of music from across Europe but not any Europe that you’d normally find music collected from. It’s a Europe full of computer synths and machines, but not a shiny prosperous technologically advanced place filled with Ibiza copycat nightclubs…the machines wheeze and splutter like the grandchildren of a family of pre World War One phonographs. It’s a Europe with a history and tradition but the sort that normally gets quietly buried and not talked about. There’s elements of techno, dubstep and electronica but twisted and broken. There are songs, but often ending in a different language or the order that they start in. For example, ‘Van Diemans Land’ is an Irish version of a song also well known in England and Scotland, this version being partly recorded in Poland with a rap in Mandinka recorded in Prague. This wasn’t because people weren’t available to travel; the whole point is that the music travelled and the musicians stayed where they were and waved goodbye. ‘Against the Storm’ features the voices of Czechoslovaks who were soon to have to leave their country after the Nazi takeover in the 1930s. The dubstep mix was made in Prague and the Czech voices mixed in London. Some of the songs are very old, but most come from some time around the turn of the century. ‘I Left My Sweet Homeland’ is an anthemic Hungarian song about, well, about exactly what it says. Another Hungarian song, ‘Away to a Stranger’ is based on a traditional song about a man being conscripted into the army; modernised and re worked it’s become a song about a woman being conscripted in a very different manner.